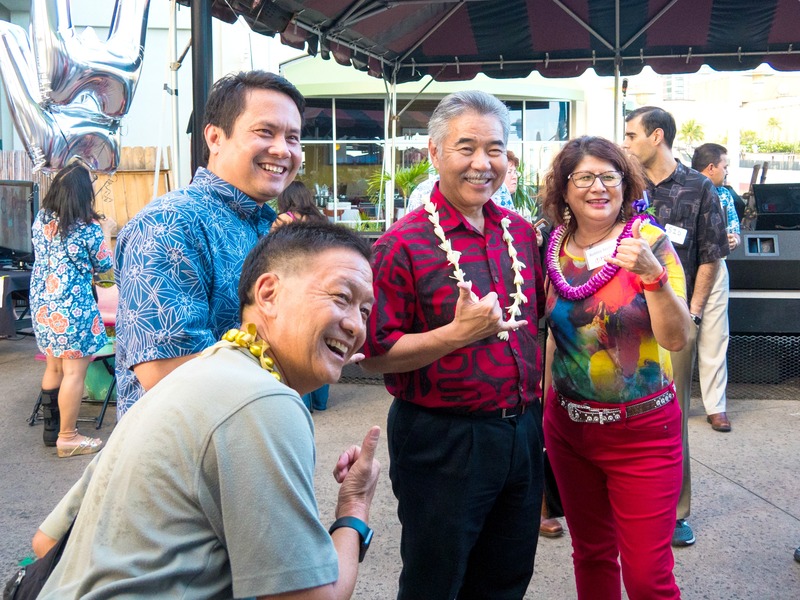 NETWORKING: HPR’s “Bytemarks Café” co-host Burt Lum, DBEDT director Luis Salaveria, Gov. Ige and HTDC director Robbie Melton. The picture you see on High Technology Development Corporation’s (HTDC) home page reads, “Welcome home, Brian Dote.” The site tells the story of how local folks found jobs that brought them home to Hawai‘i. That’s what Gov. David Ige envisions for kama‘aina: a way to reverse the “brain drain” and develop an innovation economy that combines can-do local entrepreneurship with cutting-edge technology and innovative, future-focused thinking. Under the governor’s leadership, the state is developing new ways to create at least 80,000 new tech and innovation jobs earning $80,000 or more by 2030. If this seems like a distant goal, you just have to spend some time with HTDC director Robbie Melton to understand how real it can be for Hawai‘i. “We’re on the right trajectory,” Melton said. “Now we need the right funding and community support to develop the talent that’s here.” For the governor, Melton and others, an innovation economy is the key to the state’s future: creating technology to improve people’s lives, increase business productivity and provide new, more sustainable, higher-wage jobs through 21st century education and training. As one example of what’s happening already, she points to the success of Maui Brewing Company, recently named the 2017 National Small Business Persons of the Year. The company received an HTDC Manufacturing Assistance Program (MAP) grant to improve its efficiency and expand production. 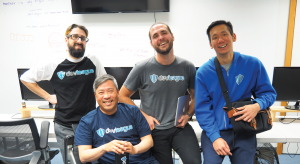 The state also is part of a national TechHire initiative to fast-track training for high-paying tech jobs to meet 21st century workforce demands. Employers and job seekers can go to HTDC’s TechJobsHawaii.org for a listing of available positions statewide. 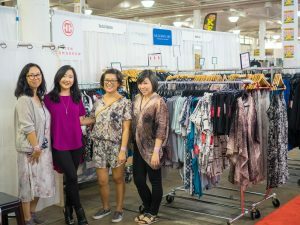 THE COLLECTIVE: Rumi Murakami, Mari Nakamura, Allison Izu and Summer Shiigi joined forces to help local fashion designers. Melton said HTDC’s goals include reaching out statewide through its Neighbor Island Innovation Initiative (NI3) to provide business assistance for small, tech-based companies, developing agriculture tech for Hawai‘i’s food security, helping boost clean energy and aerospace initiatives, and working with the state’s industry leaders and educators to train local talent for jobs. “We need to find ways to match local talent with the skills needed so people don’t have to go to the mainland for work,” said Melton. HTDC helps build the tech community through events such as WetWare Wednesdays, entrepreneur and manufacturing events and grant workshops. Their annual Tech Fair between Christmas and New Year is a way for college students home for the holidays to see where the jobs are. 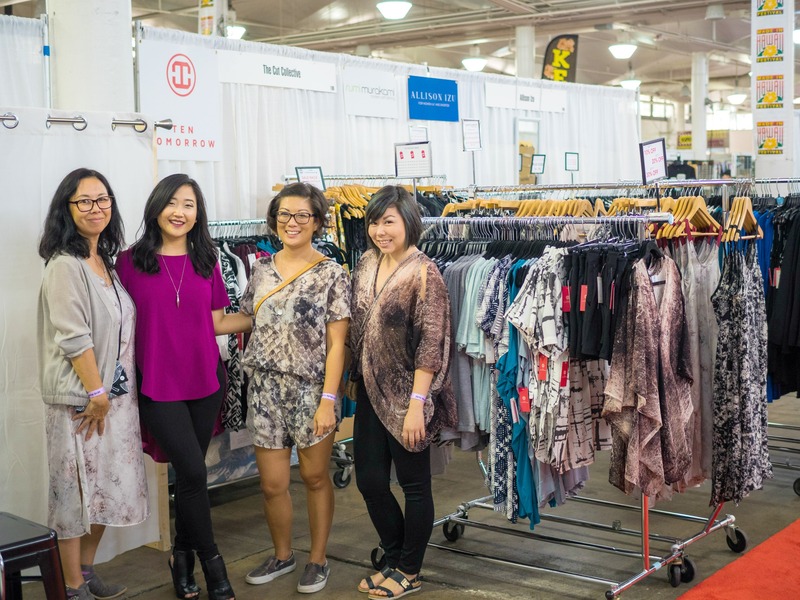 HTDC also provides matching grants through its Hawaii Small Business Innovation Research (HSBIR) program to help move products into the market. For the first time, a special SBIR road tour will be coming to Hawai‘i Sept. 18 and 19 to connect grant applicants with federal agencies that can fund technology development. ENTREPRENEUR SANDBOX: HTDC expects to start construction in January 2018 on this public innovation space in Kaka’ako for people of all ages to learn about new, 21st century technology. HTDC says every innovation job creates five additional support jobs.